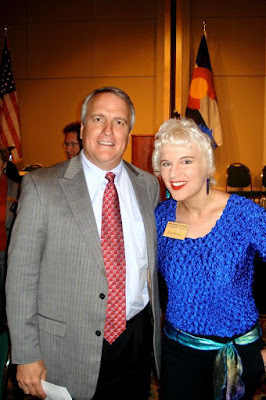 I had the privilege of meeting Colorado Governor Bill Ritter in person this week at the Many Voices, One Vision Colorado Summit on Children, Youth and Families. This conference is both the 17th annual Colorado Child Welfare Conference and the 8th annual Judicial Family Issues conference. The conference attracted over a thousand participants. Both the Governor's speech and the workshop presentations that I attended were incredibly valuable... I will be posting further information in upcoming blog entries. I and two other members of Foster Care Alumni of America presented two concurrent workshops on "Demystifying Emotional Resiliency." Our audience included: judges, lawyers, guardians ad litem, CASA volunteers, social workers, caseworkers and foster parents. 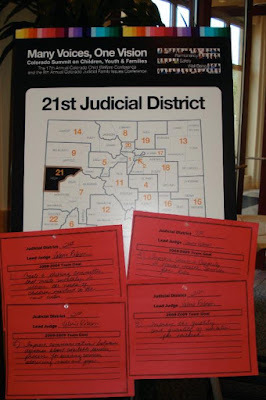 Each of Colorado's 22 judicial districts were represented at the conference, and posted concrete evidence of what they were doing to help children and families. The focus areas were: Permanency, Safety and Well-Being. The judicial participants in this conference were there because they believe in front-end solutions, and dedicate their time to make a lasting and positive change. As one judicial staff member, who shall remain anonymous, said to me, "It's cheaper in the long run to do things right up front." And also, "Too often, with government, there's never enough time and money to do it right, but there's always time and money to do it over." Please stayed tuned to read excerpts from Gov. Bill Ritter's speech, insights about youth engagement in permanency initiatives and to learn how United Way empowered young people in and from foster care to advocate for sibling visitation.